I find waiting hard. Despite all the many chances I've had to wait on the Lord in the past, somehow its never easy to do in the present. However, looking back on all the miraculous ways God has moved in the past does give me confidence in His wisdom, perfect timing and goodness. God has been sending me many reminders lately to wait on Him. The latest one came from a poem a friend posted on their blog. It talks about someone who is praying for something specific and claiming God's promises in faith. 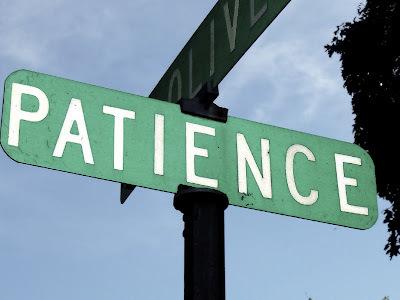 They become impatient and discontent with God's constant answer of "Wait". In the last part of the poem God explains how He is able to send signs and move mountains, but how we would miss the most important lesson of all if we never had to wait on Him. I was convicted with the truth of it...the greatest gift is to know God our Father! Nothing else compares. God hears our prayers but, in His tender love and wisdom, He sees our need of Him as greater than our need for immediate answers. He will not ignore our fervent petitions for healing , jobs , relationships or whatever may be pressing on our mind. In His perfect time He will move. But we have the more precious gift in the meantime...more Of Him! Ah how I needed this post right now. Thank you Heather.